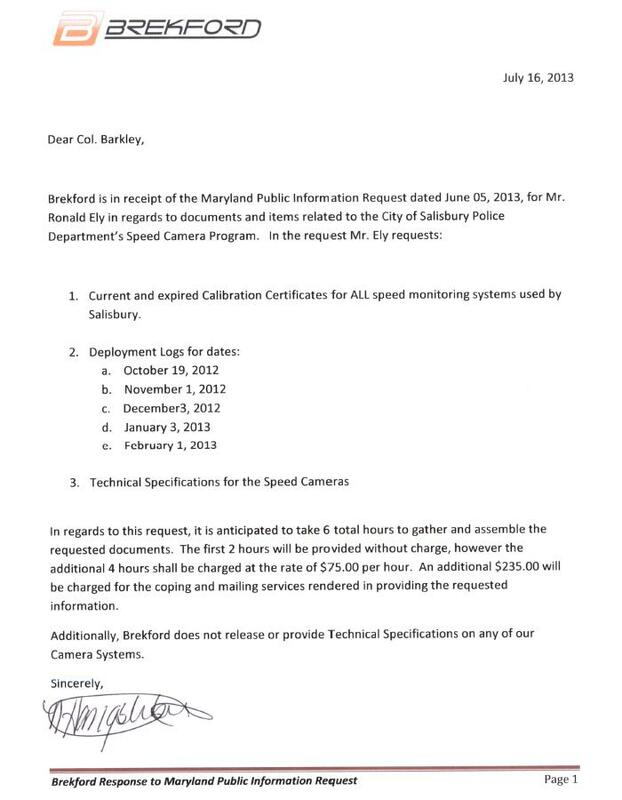 The city of Salisbury has claimed that it does not have custody of annual calibration certificates and daily setup logs for it's speed cameras, and has instead stated that we need to acquire the documents directly from Brekford Corporation, who is demanding a fee of $535 for copies of the records. 1) The annual calibration certificates for ALL speed monitoring systems used by Salisbury during any portion of 2011, 2012, or 2013. I am seeking both current AND expired certificates. 3) The technical specifications of speed cameras used in Salisbury. Salisbury does not report the precise locations of their speed cameras on the city website, however open sources indicate their are about 8 locations operating in the city. We had requested annual calibration certificates, which are only one certificate per device per year, and setup logs for just 6 days. State law requires local governments to respond to an MPIA request within 30 days. However no documents were received by July 6th. Salisbury stated to us that they had forwarded the request to their contractor. On July 29 (53 days after the city originally received our request) we finally received a response from the city. "In response to your request for information under the Maryland Public Information Act, please be advised that items 1,2 &3 are all records not kept by the City of Salisbury but are maintained by Brekford. In accordance with transportation article 21-809 these documents are provided to us for court relevant to the violation in question. Please feel free to contact Brekford for the information you have requested (see attached). " The letter from Brekford stated that the documents would be provided only for a fee of $75 per hour PLUS an additional $235 in copying fees, for a total of $535. Furthermore, Brekford denied access to the technical specifications of their device. It's hard to know where to begin listing all the things wrong with this response. The fee charged by the contractor is well in excess of actual search costs. $75/hour works out to a salary of about $150,000/year. By our estimates $235 in copying fees works out to close to $1.95 per page (though the exact number of pages was not specified). Typical fee schedules for public documents by local governments are around 25 cents per page. The Public Information Act does not allow costs to be charged which are designed to produce a profit. Salisbury has acknowledged that it does not have calibration records "kept on file" as state law requires. The fact that the city does not have calibration records on file brings into question who controls and dare we say who "operates" the speed camera program. The stated search time is implausible because Brekford obviously has a filing system for such commonly accessed records which allows them to retrieve them almost immediately. Furthermore, if search does require 6 hours of time then why was our request delayed more than 30 days just to tell us the cost to INITIATE the search? State law clearly says MPIA requests are to be completed in the earliest possible time, and the 30 days is a MAXIMUM response time is not a mandatory waiting period to begin a search. The company is denying access to all technical specifications of the equipment. Arguably the certifications might not even be meaningful in terms of showing whether the devices are accurate without a technical description of the devices. Basically they are saying the public is just supposed to "trust us" when Brekford says their equipment is of a sort which is reliable, since they are withholding all documents which describe the technology. The fact that the city does not have ready access to these documents except at hearings means implies that the city is not responsible for checking the status of the annual calibrations prior to issuing individual citations. This makes it seem plausible that have been past problems with calibrations for these cameras which would have gone unnoticed until now. The more than 30 day delay and the excessive fees appear to be a deliberate effort by Brekford Corp to prevent our organization from obtaining the calibration documents in a timely manner. Now why do we say #9 and 10? Because Brekford Corp recently got nailed for having run speed cameras with expired calibration certificates in Greenbelt and in Hagerstown. Those refunds cost Brekford approximately $52,000. If any speed cameras had been operated in Salisbury with expired certificates between October 2012 and February of 2013, Brekford would obviously have realized that the documents responsive to our request would have revealed that. And yet the decision as to whether we get to see these legally required documents, and under what terms, has been left entirely at the discretion of the for profit contractor whose bottom line (and perhaps also their bottoms) would have been at risk if the documents reveal a problem. “[a]ll persons are entitled to have access to information about the affairs of government and the official acts of public officials and employees.” AND “[e]xcept as otherwise provided by law, a custodian shall permit a person or governmental unit to inspect any public record at any reasonable time.” The fact that state law requires speed camera calibration records to be "kept on file" makes plain that they are public records, and the fact that the SHA has placed their calibration certificates online makes plain that these documents are of a sort for which there is no question about their disclosability. The public has been assured that because these calibrations take place, that we can trust the equipment is accurate and reliable. 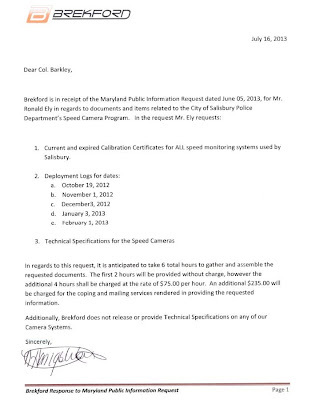 If The People, the press, and organizations like the Maryland Drivers Alliance cannot readily access these records without being subjected to unreasonable delays and then being forced to pay a speed camera contractor a 'tribute' in the form of an excessive fee, then those assurances are utterly meaningless.